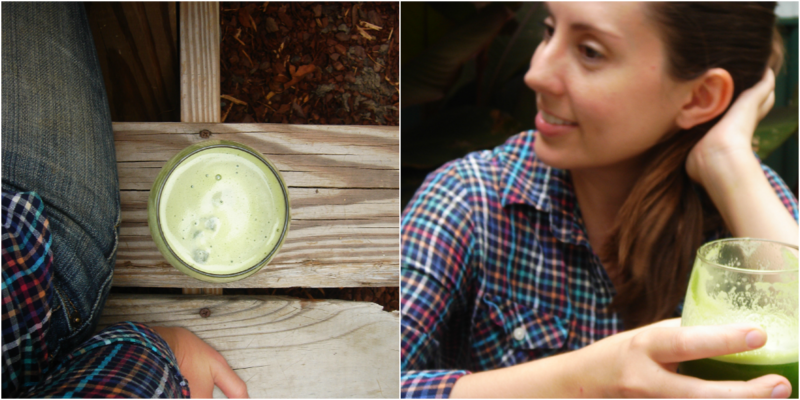 I've written before about green juice and why we drink it. I've really been slacking with juicing lately and I'm trying to get back on the bandwagon. Tonight when I got home from work, David and I had a juice break before tackling the evening chores. It may be hard to believe, but David is the biggest fan of juice around here. I feel like it's an acquired taste that I'm still getting used to, but David loves it. I'm going to just count my blessings on that one. The chickens love it when we juice, too, because they get all the pulp that is left behind after the juice is extracted. Nothing wasted here. I don't feel like it's realistic for us to get a glass of juice every single day, so if I've noticed we haven't had a healthy dose of greens in several days, I'll make some juice. I just want to make sure we get plenty of greens, whether in solid or liquid form! And look at your chicken following suit in consuming the healthy stuff....good for you for drinking - AND teaching - it! Buttercup was chowing down! Some of the younger chicks came over to check it out and she kept shooing them away haha. David's making up for all the vegetables he missed out on as a child. Yep, trying to make up for lost time! I'm just glad he likes veggies and drinks the juice happily.